Life here is busy, but it’s a good kind of busy. We have less driving and commuting than when we lived in Ohio…and we don’t miss traffic jams, shoveling snow, and de-icing the car in the morning, which used to take up so much time. Here, grocery shopping or paying bills involves a bike ride or a walk in sunny weather, where you can hear birds and see the beach. We’ve just returned from a fun weekend of showing our family the islands of Ambergris Caye and Caye Caulker, where we snorkeled with turtles, ate a mountain of lobster, swam in the ocean, lounged in hammocks on the beach, and kayaked in the Caribbean. I also got the chance to show my family the unbelievable number of things to do in our little, thriving village. We went tubing on a lazy river through the tropical forest and saw crocodiles and monkeys at Monkey River. Another day we hiked up a small mountain with 360-degree views of mountains and the Caribbean, and swam in a waterfall. We also visited Mayan ruins, hung out for an afternoon with a Maya family and learned how to make Maya chocolate. Belize has so many great activities to offer. As part of our regular week, we like to kayak, go fishing, and hike—we try to choose a couple activities a week that we know we could never do in our hometown (especially in winter). A bonus to living here is that we’ve learned how to do things like the locals. For example, we’ve found out where they go on their days off…they know where the most beautiful waterfalls are, the best hiking spots, and the places to snorkel without taking an expensive excursion. The farmers market in Placencia is the best place to get fresh produce for great prices and it’s fun to stroll around. Another thing we like to do is wander around the farmer’s market. The produce comes from local, organic, family farms, and everybody shops there…and I pay about 60% of what I was used to paying in the U.S. The variety of exotic fruits and vegetables changes weekly; everybody seems to find their favorite stands where you know the stand owners by name, and they will even explain how to cook with the produce. Sometimes they will even throw in a sample or two for free. I normally spend about $20 to $40 and walk away with four bags of produce. The same amount in the U.S. would cost double if not more, and it is all organic. With all the fresh produce I like to make homemade salsa, pickled onions, and huge salads. While I miss convenience food sometimes, I have learned how to use the ingredients available and cook more like a local. 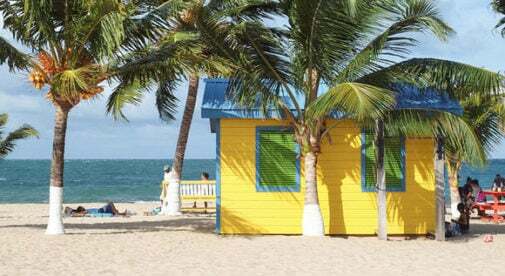 Even though Placencia is small, we seem to have endless activities to keep us busy. We’ve been here for two years and there’s still so much we want to do. Next on our agenda is getting certified to scuba dive, kayaking to the cayes you can see from our shore, and we have more hiking trails we still want to try. The longer we live here, the better the experience as we find out so many secret places a bit off the tourist track.